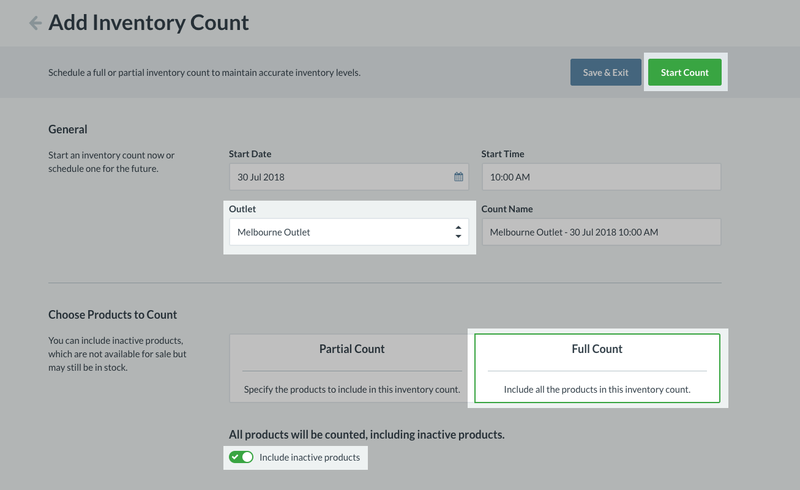 Setting Your Inventory to Zero Through a Full Inventory Count – How can we help? 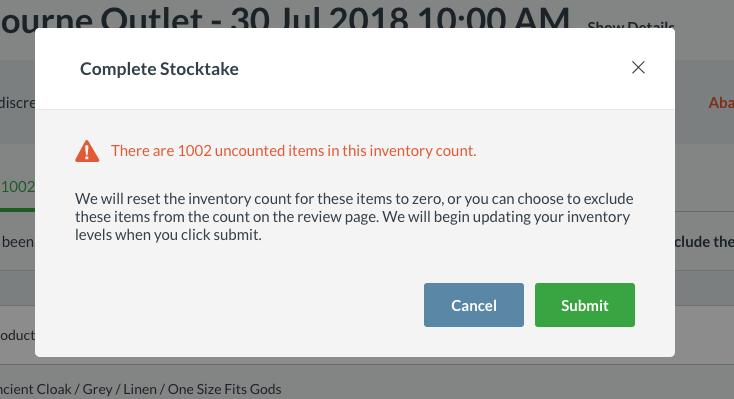 This article will focus on how to set your inventory to zero by conducting a Full Inventory Count. Situations where you may want to do this include, for example; you are trialling Vend and want to add the correct inventory amounts before your store goes live, setting up a third-party integration and you may want to check how the inventory will flow into Vend, or you would like to start over. 1. Start a full inventory count. To learn how to do a Full Inventory Count, click on this link. 2. Make sure to choose the correct outlet, select Full Count, and make sure Include inactive products is checked and green. 3. Click on Start Count. 2. Wait for all the products to load and click on Review. 3. Do not count any products as all the uncounted products will be set to zero on completion of the count. Click Complete. 4. A warning message will pop up to inform you that your uncounted products will be reset to zero. Click on Submit. 5. To ensure that all of your products are set to zero, click on Generate CSV Report -> Download CSV. Make sure that under the inventory column on your CSV, that the products are set to zero. Note: Depending on the number of products you have in your outlet, it may take several hours to update your inventory. For example, for 1000 products, it should not take more than 15-30 mins. 6. If you have more than one outlet, you can repeat the steps above to zero your inventory for your products across all your outlets.